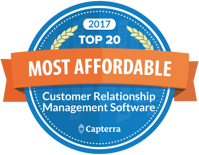 We’re excited to announce today that HubSpot has been named a Top 20 CRM software in the Most Popular, Most User-Friendly, and Most Affordable categories by Capterra, a free online service that helps organizations find the right software for their business. Of the more than 500 CRM products listed on the site, HubSpot was one of just three solutions to be named to all three Top 20 categories. The Top 20 Most Popular software report is an independent assessment that evaluates customer base, number of active users, and social presence to generate a list of market leaders in the CRM space that offer the most widely-adopted solutions. Each report has a distinct function aimed at helping a software buyer find the best software product based on their needs, whether that’s getting the best bang for their buck, finding a product that’s easiest to use, or researching the biggest players in the space. HubSpot CRM gives growing marketing and sales teams everything they need to build relationships with their leads, prospects, and customers – all available for free. More than 670 Capterra reviewers have ranked HubSpot CRM at 4.5 stars out of 5, citing the platform’s powerful tools and all-in-one capabilities as some of the top selling points. Read HubSpot reviews and learn more about HubSpot CRM at capterra.com/HubSpot-CRM/. 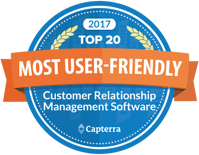 To check out the full Capterra reports, please visit capterra.com/customer-relationship-management-software/.